Definition at line 42 of file DiskdIOStrategy.h. Definition at line 89 of file DiskdIOStrategy.cc. Definition at line 528 of file DiskdIOStrategy.cc. References away, diskd_stats_t::block_queue_len, DBG_IMPORTANT, debugs, handle(), magic2, diskd_stats_t::max_away, diomsg::msg_snd_rcv_sz, SharedMemory::put(), diskd_stats_t::recv_count, rmsgid, diskd_stats_t::sent_count, shm, and diomsg::shm_offset. Definition at line 423 of file DiskdIOStrategy.cc. References optionQ1Dump(), optionQ1Parse(), optionQ2Dump(), optionQ2Parse(), and ConfigOptionVector::options. Definition at line 289 of file DiskdIOStrategy.cc. References _MQD_CLOSE, _MQD_CREATE, _MQD_OPEN, _MQD_READ, _MQD_UNLINK, _MQD_WRITE, assert, diomsg::callback_data, cbdataReferenceDone, cbdataReferenceValid(), DiskdFile::completed(), debugs, diomsg::mtype, diomsg::newstyle, diomsg::status, and unlinkDone(). Definition at line 137 of file DiskdIOStrategy.cc. References comm_close, commSetNonBlocking(), commUnsetFdTimeout(), Config, DBG_CRITICAL, debugs, SquidConfig::diskd, fatal(), fatalf(), fd_note(), hIpc, SharedMemory::init(), instanceID, IPC_STREAM, ipcCreate(), magic2, MYNAME, NULL, pid, SquidConfig::Program, Comm::QuickPollRequired(), rmsgid, Ip::Address::setLocalhost(), shm, smsgid, wfd, and xstrerr(). Definition at line 65 of file DiskdIOStrategy.cc. Definition at line 79 of file DiskdIOStrategy.cc. References NULL, openFailed(), and shedLoad(). Definition at line 43 of file DiskdIOStrategy.cc. Definition at line 73 of file DiskdIOStrategy.cc. Definition at line 465 of file DiskdIOStrategy.cc. Definition at line 432 of file DiskdIOStrategy.cc. References DBG_IMPORTANT, debugs, and magic1. Definition at line 497 of file DiskdIOStrategy.cc. Definition at line 471 of file DiskdIOStrategy.cc. References DBG_IMPORTANT, debugs, and magic2. Definition at line 337 of file DiskdIOStrategy.cc. References diomsg::callback_data, cbdataReference, Lock::lock(), diomsg::newstyle, diomsg::requestor, and SEND(). Referenced by DiskdFile::close(), DiskdFile::create(), DiskdFile::open(), DiskdFile::read(), unlinkFile(), and DiskdFile::write(). Definition at line 352 of file DiskdIOStrategy.cc. References diomsg::callback_data, cbdataReference, RefCount< C >::getRaw(), diomsg::newstyle, and SEND(). Definition at line 362 of file DiskdIOStrategy.cc. References assert, away, Store::Controller::callback(), diomsg::callback_data, cbdataReferenceDone, DBG_IMPORTANT, debugs, diomsg::id, int, magic2, diomsg::msg_snd_rcv_sz, diomsg::mtype, MYNAME, NULL, diomsg::offset, SharedMemory::put(), Store::Root(), diskd_stats_t::sent_count, diomsg::seq_no, shm, diomsg::shm_offset, diomsg::size, size, smsgid, diomsg::status, and xstrerr(). Definition at line 49 of file DiskdIOStrategy.cc. References away, debugs, and magic1. Referenced by newFile(), and unlinkFile(). Definition at line 573 of file DiskdIOStrategy.cc. Definition at line 507 of file DiskdIOStrategy.cc. References away, callback(), DBG_IMPORTANT, debugs, and squid_curtime. Definition at line 277 of file DiskdIOStrategy.cc. 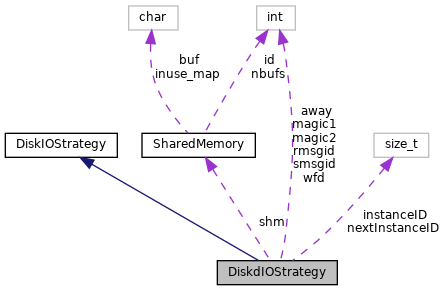 References SharedMemory::buf, debugs, StatCounters::disk, diskd_stats_t::fail, shm, diomsg::shm_offset, statCounter, diomsg::status, diskd_stats_t::success, StatCounters::syscalls, and diskd_stats_t::unlink. Definition at line 93 of file DiskdIOStrategy.cc. Definition at line 99 of file DiskdIOStrategy.cc. References _MQD_UNLINK, buf, DBG_IMPORTANT, debugs, SharedMemory::get(), NULL, diskd_stats_t::ops, send(), shedLoad(), shm, SHMBUF_BLKSZ, diskd_stats_t::unlink, unlinkdUnlink(), xstrerr(), and xstrncpy(). Definition at line 89 of file DiskdIOStrategy.h. Referenced by callback(), load(), SEND(), shedLoad(), statfs(), and sync(). Definition at line 93 of file DiskdIOStrategy.h. magic1 is the number of messages away which we stop allowing open/create for. Definition at line 79 of file DiskdIOStrategy.h. Referenced by optionQ1Dump(), optionQ1Parse(), and shedLoad(). magic2 is the point at which we start blocking on msgsnd/msgrcv. If a queue has magic2 (or more) messages away, then we read the queue until the level falls below magic2. Recommended value is 75% of SHMBUFS. Definition at line 87 of file DiskdIOStrategy.h. Referenced by callback(), init(), load(), optionQ2Dump(), optionQ2Parse(), and SEND(). Definition at line 64 of file DiskdIOStrategy.h. Definition at line 91 of file DiskdIOStrategy.h. Referenced by callback(), and init(). Definition at line 60 of file DiskdIOStrategy.h. Referenced by callback(), DiskdFile::create(), init(), DiskdFile::open(), DiskdFile::read(), DiskdFile::readDone(), SEND(), unlinkDone(), unlinkFile(), and DiskdFile::write(). Definition at line 90 of file DiskdIOStrategy.h. Referenced by init(), and SEND(). Definition at line 92 of file DiskdIOStrategy.h.